From days of old until now, there is not much to stay when the end draws near. We see it coming but we cannot fathom how we will fit through that tiny door that has never been opened by anyone who has lived to tell the tale. We are alone as we face the darkness and no one can reach us. It is up to us how we pass. Whether it be with our wits, with grace, willingly on our two feet, or fighting to stay in the present. It is our choice. We all know the end will come and yet our preferred view of it is with sideways glances and quick glimpses before we turn away. In fact, I think our favorite view of the final passageway is no view at all. But there it lies nonetheless and if it helps to envision it as an old black and white film from the silent era, well then that’s fine. We get to spend our lives living through all sorts of endings: of friendships, of childhood, of homes, neighbors and jobs, years and passions. As we pass through the many phases of our lives we build up the strength to continue on our journey and discover to our surprise that we’ve passed from one stage to the next. We’ll have plenty of time to practice. So this dark thorny cave ending need not be so frightening. We’ve gone this way before, in little bits and little steps, and each time we were made stronger. It is all part of our journey. 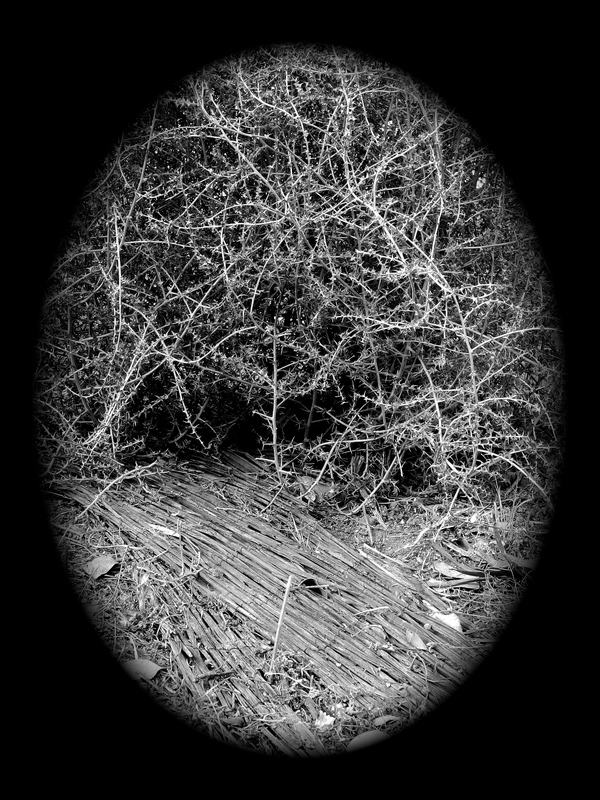 Note: This tumbleweed image took ahold of me and I did not intend to write so darkly. I was enveloped in a thorny bramble that had images of weed poetry in it, and I had not the strength to look away. Perhaps it’s only about our journey towards the coming end of the year and nothing more. I really can’t say.